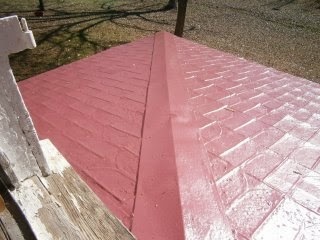 Berridge and vintage shingles: Morganton, NC, project - Roof Menders, Inc. In Morganton, North Carolina, the owner has successfully incorporated modern version of a traditionally designed tin shingle found on the upper level. 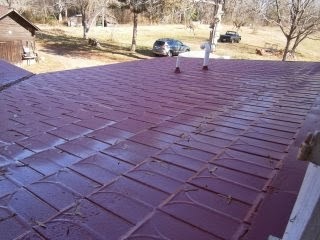 The old tin shingles were coated with a custom colored application that retards rust and adds a luster to the traditional roofing. 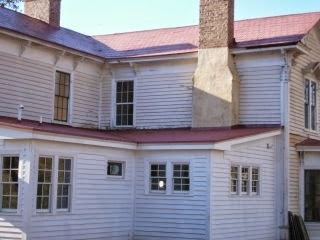 The Berridge shingles over the kitchen received the same coating application in order to blend the various roofs on the North Carolina historic home. There are some differences between old and new shingles themselves. four differences, in fact, but not detectable to the casual onlooker. Please pardon the quality of the photos–one roof was in the shade when I was there. Just a minor note: the ridge cover over the traditional tin shingles is a Berridge ridge cap. It works just fine.